Ananka's Diary: Who Knew Dormice Were So Interesting . . . and Delicious? i am so happy i was not born a dormouse. ...in *honey*? I would not eat any meat in honey. The stuff is not the tastiest marinade, take it from someone who knows. I've never had dormice though. It was chicken in honey and breadcrumbs. The mix of meat-flavor and honey-sweet did not work. What kind of sick twisted movie is it? It's Alice in Wonderland, of course. I always wondered why Wonderland got all the hype & movies. The Land Behind the Looking Glass is so much cooler. Fascinating, but I'm suddenly feel queasy. Maybe Alice was Italian in the book. Stupid movie makers.... :) I think I'm gonna stick to chicken for food, and chamomile for sleep! 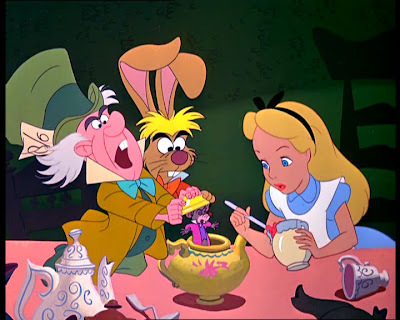 I never trusted the cartoon Alice in Wonderland. I would have been known as the "Girl who got fat off of dormice" in Queen Lizzy I's time... I'm always so sleepy. the romans also shoved them into eachother to "heal wounds" another interesting fact from Cambridge Latin. lovely, right? they ate lots of weird stuff. I looked at some pictures of dormice... how could they eat something so adorable? Tsk tsk tsk. I personally prefer my dormice broiled & marinated in a truffle oil and raspberry vinigrette, with a side of couscous and sauted asparagus. I agree with Kira, but I've always been partial to olive oil (extra virgin. Just don't like the smell of truffles. Alice is not looking to eat the dormouse with honey, she was going to put honey on her tea, when out f the teapot popped a dormouse. That's why she looked surprised.It is NOT a twisted movie, just kind of strange. LOVE THE BOOK! Kathleen: Congrats! That's a great role. I like mice, so I wouldn't eat them... But all over the world pretty much every animal known to man has been eaten at some point in time by someone.